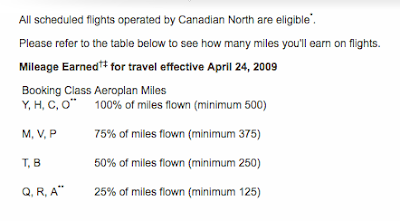 Rewards Canada: Flying Canadian North? Remember that you can do a rare mileage earning double dip! Flying Canadian North? Remember that you can do a rare mileage earning double dip! A tip for our readers who are planning to fly Canadian North, whether it's from Edmonton or Ottawa to the North, vice versa or from one Northern town to another, you can double dip your earnings on these flights. We've mentioned it before on the site but wanted to remind you all that if your travels do take you on Canadian North, you can earn both Aurora Rewards Points and Aeroplan miles on these flights. This is very rare for any frequent flyer program globally as the normal rule of thumb is that you can only earn miles in one airline program per flight you take. For example you fly on Delta Airlines you can choose to earn Delta's SkyMiles or Korean SKYPASS Miles or any other SkyTeam airline program miles but you can't earn in more than one of them. You have to choose one and one only. Well count ourselves lucky but Canadian North is the only airline in the world that we know of that will actually let you earn in two programs for the same flight. Normally double dips require some sort of bonus to be achieved but flights as you can see flying on Canadian North does not. Of course throw in the fact that you should use a point/miles earning credit card for the actual flight booking and you're earning even more mile/points so every flight should be a triple dip (Aurora Rewards / Aeroplan / Credit Card) Then on top of that Canadian North do run the occasional flight bonus offer which then would make it a quadruple dip! Whew! That's a lot of ways you can earn miles/points for just one flight! 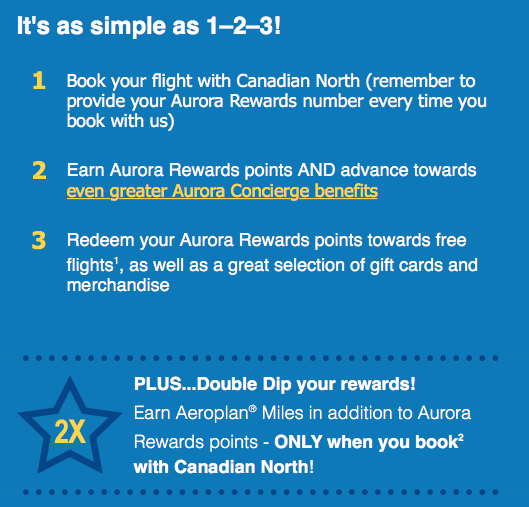 So next time you fly on Canadian North make sure you are earning both Aurora Rewards Points and Aeroplan miles! Why aren't you using a rewards credit card? We're back and there will be lots to cover!